No, I’m not talking about the closet. It’s the bathroom. In such a small room every detail is very noticeable so when it comes time to remodel, craftsmanship and attention to detail are critical. Bathroom remodeling comes in many forms, and the most basic option involves simply updating the outdated surfaces and replacing old fixtures. Just this basic revamping will dramatically change the feel and appearance of the room. Beyond this, the sky is the limit. How about a separate shower and soaking tub? Would you like a walk-in shower that looks like a spa? Then again, you could really use 10 jets of digitally regulated water pressure in that spa shower. 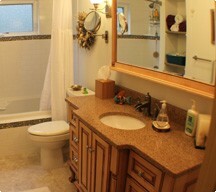 Heated tile floors are very nice, as are steam showers. Think about it! We can help you with all of the above, give us a call when you are ready for an estimate! 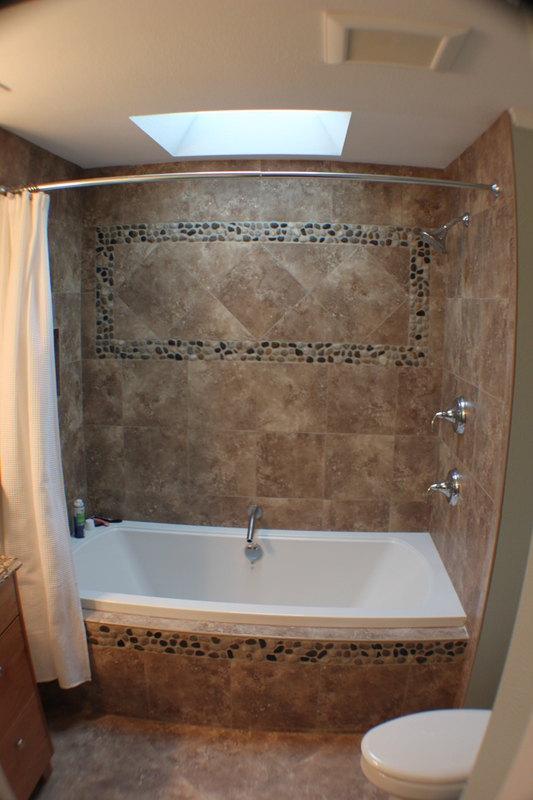 Wonderful tiled tub/shower with curved shower curtain rod.